This superblock, part of Weeber's own urban design masterplan for the Forum quarter, combined a slab of eight dwelling levels with a U-shaped block of six more rounded off at one corner. Both rested on a basement of parking space, storage facilities and shops. All dwellings were reached from access galleries on the block's inner side. Above the car park was a communal garden. External facades were clad in black-tiled precast concrete panels. 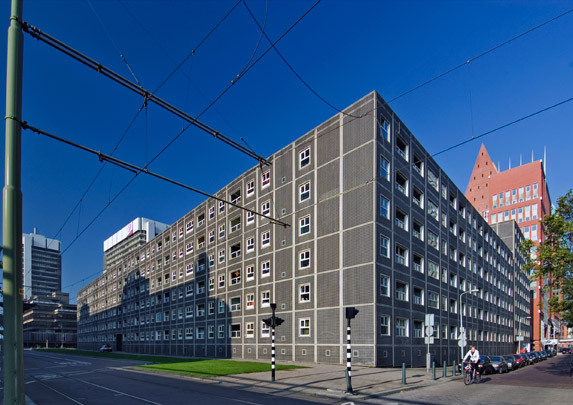 In 2000 the City of The Hague elected to demolish the 15-year-old complex to make room for new ministry buildings. After much protest and several courtcases the building was demolished in 2007.